I like my cherries drenched in booze and muddled with lime and mint. This Black Cherry Mojito is my new summer love. We’re together every weekend. I’m not one for public affection. I’m not against it. I just prefer to keep my hands to myself when I’m strolling the streets. It has nothing do with how other people might perceive me and everything to do with the fact that I’m the least romantic woman on the face of the earth. Go ahead, I’ll let you feel bad for Squirrel, but just this once! Then this Black Cherry Mojito entered my stratosphere, and we’ve been holding hands ever since. Every weekend, I bust out all of the ingredients–lime, mint, cherries, rum, simple syrup, club soda–and work that muddler. After my arm workout with the muddler, I take my mojito to the yard–the backyard–and show it off to all of my family and friends. Of course everyone is jealous, and I can’t blame them, really, because it is one smokin’ hot mojito. I use a combination of pitted cherries and black cherry rum to achieve the intense cherry flavor in this bubbly tropical cocktail. As with any mojito, you can taylor it to meet your taste. If you like your mojito on the sweeter side, add more simple sugar. If you like it on the tart side, add more lime juice. My recipe is there to guide you; feel free to own your mojito. Lime, mint, and cherries get muddled together with black cherry rum. 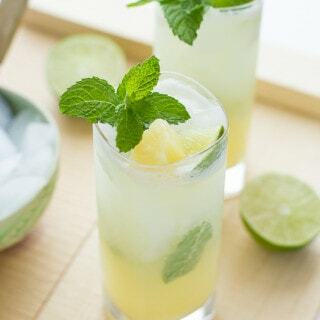 This tart and refreshing cocktail is perfect for summer living. Muddle lime juice, cherries, mint, and simple syrup in the bottom of a highball glass. Add rum and stir to combine. Fill the glass with ice and top with club soda; stir to combine. Garnish with mint, lime wedge, and cherry.